Spirits are obtained by double distillation of white wines harvested in the area bounded by the “Label of Origin” (Appellation d’Origine). When the fermentation is complete, the white wine must be distilled in order to turn it into wine spirits. It should not be forgotten that alcohol is a natural product obtained by the fermentation of sugar in the original form of fructose and glucose existing in fruit. But alcohol is associated with many other compounds and the sorting of these between the numerous substances can only be obtained by distillation. The principle of distillation is based on the differences in volatility of the diverse compounds. Only the volatile substances that make up the principal elements of the “bouquet” can be found in wine spirits. 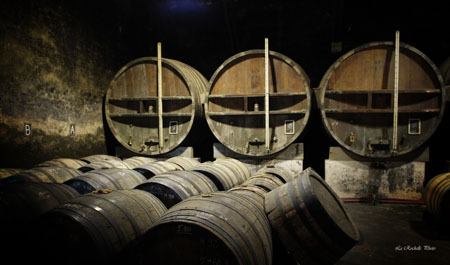 Since the birth of Cognac, the process of distillation has not changed. The Charente-type copper still comprises a characteristically shaped boiler set over direct heat; a still head shaped like a turban (the traditional "tête de maure" form), an olive, or an onion; and a swan's neck tube that continues to become a coil, passing through a cooling tank referred to as the "pipe”. The distillation is done in two stages, or two periods or heating: ***First of all the unfiltered wine is introduced into the part of the still which is called “the boiler” and then heated until it reaches boiling point. The alcohol vapors are released and accumulate in the dome before continuing into the swan’s neck tube and the coil. On coming into contact with the refrigerant, the vapors condense and become a distillate known as “brouillis” (alcohol) at about 28 to 30 degrees (but one should speak about percentage / volume, say from 28 to 30% volume). This “brouillis” has a slightly milky aspect. *** Then the “brouillis” is returned to the still – in the boiler – for a second distilling process that is called “la bonne chauffe”. For this second heating the capacity of the boiler must not exceed 30 hectoliters and the volume is limited to 25 hectoliters. 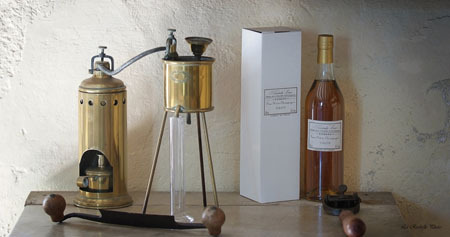 The distiller must then perform a delicate operation called “la coupe” (the cut). The first drops of spirits that flow must be eliminated: the alcohol content is too high and gives it an ethereal nose; they are called “heads” and represent about 1 or 2 % of the distillation volume. The distiller lovingly conserves the heart: a clear and limpid spirit that will become Cognac. Then it must choose the exact moment when to eliminate the seconds: after the “heart”, when the alcoholmeter indicates 60% vol., the spirit loses its fineness and distinction; the bouquet becomes heavier and the choice of the cut is extremely important. Finally it eliminates the “tails”, i.e. the waste, or the spirit remaining after distillation, since it would be too strong. “Heads” and “seconds” are re-distilled with wine or with the “brouillis”. The success of the distillation cycle, that lasts about 24 hours, requires a lot of attention, constant monitoring and considerable practice on the part of the distiller whose responsibility is capital; there are great distillers just as there are great chefs – they all have their own techniques for distillation (the proportion of fine lees, recycling of the “secondes” in the wine or “brouillis”, temperature curves……) that give Cognac the main characteristics of its personality.